These FREE 10-week clubs are for young people who are above a healthy weight to attend with their families. The clubs are designed to give young people more energy, more confidence and a better understanding of healthy living. 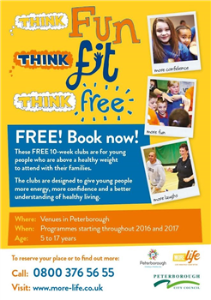 Venues in Peterborough with programmes starting throughout 2017. Suitable for children aged from 4 to 8 years and 9 to 17 years.